Visitors are always welcome at First Mennonite Church! You will find a friendly congregation and a relaxed atmosphere. Small groups, service ministries, fellowship opportunities, and sports teams offer opportunities for a wide variety of involvements. Follow us on Facebook to find out more about FMC activities! 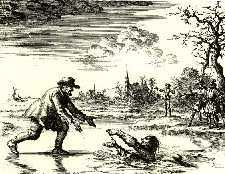 Dutch Mennonite Dirk Willems turned around to save the life of his persecutor who had fallen through thin ice. He was then captured, imprisoned, and burned outside Asperen, Holland, in 1569. Mennonites - Mennonites believe that the church is made up of people whose sins have been forgiven and who choose to follow Christ's teachings. We believe that Christians should try to relate to each other and the world in the same loving, forgiving way that Jesus practiced. Find out more about the Mennonites. Visit the Third Way Cafe for stimulating ideas and information. Directions - The church is located at the corner of Holdrege and N. 73rd Streets in northeast Lincoln, Nebraska. View directions to the church. Child Protection - First Mennonite Church is committed to the working for children and against child abuse and neglect. For more information, visit our Child Protection page.